I drafted the following list while participating in North Star of Texas Writing Project‘s Inquiry Day in April. It was a powerful day full of affirmations, inquiry, and open sharing among attendees. 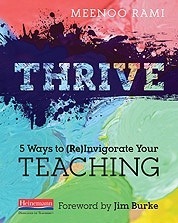 Meenoo Rami (#engchat), author of Thrive: 5 Ways to (Re)invigorate Your Teaching opened the day by sharing her own journey as a teacher leader and change agent. Today, I needed to be reminded of just these things. I came across my notes from that day along with this draft for a blog post. Students may be heading out for summer, but for many of us, we’re in the middle of the next great “now what?” as we prepare for next year’s students and teachers to return to the freshly waxed and polished halls of our schools. 1) Be open to change yourself and intentional about seeking experiences that inspire it. 2) Surround yourself with colleagues, mentors, and thinkers who share your same questions but who also have a host of their own questions to share. 3) Do not close your door. Resist the temptation when met with challenges and dissonance to simply shut your door and do your job. Find a new door to open in a network open to innovation. 4) Be vulnerable. Know that what you have to gain will often be greater than what you stand to lose. What do you stand to lose? Your pride, position, sense of control? Those are all fluid and flexible anyway–cling to them too fiercely and they’ll slip through your fingers. 5) Purposefully lose control. Cast your dice into the wind. Let the chips fall where they may. When we relinquish control, we find new avenues of influence. 6) Be subversive. If the system does not allow you to innovate, use your creativity to wield the system to innovation– sometimes without it knowing it. And, if you really need to, abandon the system. When the results are powerful, share your success. 7) To avoid debilitating frustration, seek the patterns within the system that do work. Working within them, reach for one pattern you wish to influence next. 8) Find your happy place and the people who fill it. Hold it and them near and dear. 9) Cry, scream, storm, and rant when you need to (and return to #1 to try again). 10) Sometimes, it’s true what they say– it’s better to ask for forgiveness than permission.